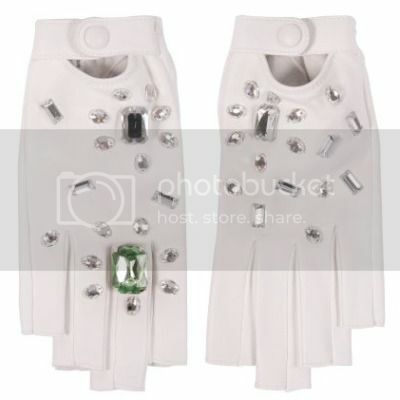 Thanks to a online French shoppe, the intersection of costume jewelry, comic books, and the whimsy of Karl Lagerfeld has been, um… intersected… resulting in these terrible, terrible Green Lantern gloves now available for sale. Ironically, price of looking like a poor man’s Michael Jackson is a whopping 495 Euros, or $600. Stupendous French talking of the english, commence! Leather gloves incrusted of stones. Why “Green Lantern”? The great powers of Green Lantern are transformed thanks to the emerald of these gloves… In super power of elegance and seduction! Via Super Punch, who only pays in Euros when looking in super power of elegance and seduction.